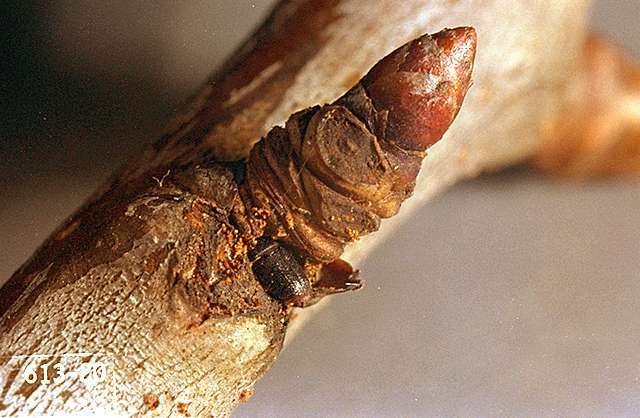 Pest description and damage Borers are pests of many different trees and shrubs. The 0.5 inch cedar borer adults are either brown to metallic gray or black with red or orange markings, depending on species. 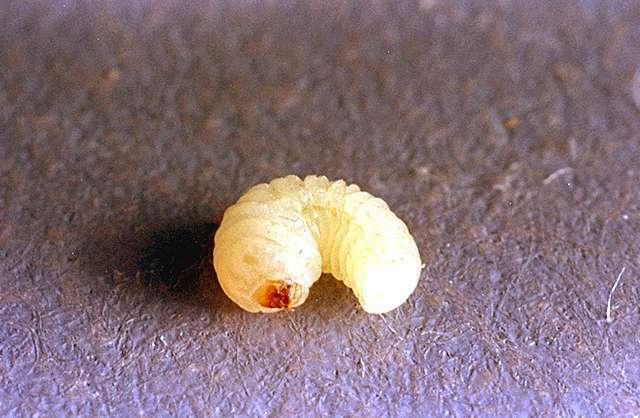 The larvae are whitish to pale yellow grubs about 0.5 inch long when fully developed and bore within the wood and bark of host plants. Just back of the larval head is a broad, flat enlargement giving the larvae a flat-headed appearance. 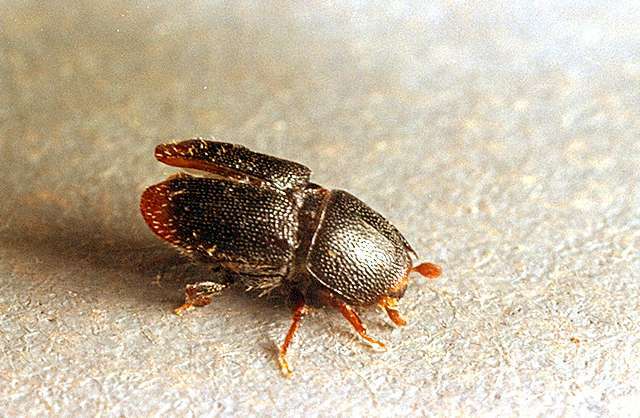 Bark beetle adults are brown beetles less than 0.08 inch long. Bark beetle larvae feed just beneath the bark on the trunk leaving characteristic engravings. The damage may girdle the trunks and branches of trees leading to death of tissues distal to the damage. Larval feeding also may be associated with weeping sap on the trunk. Young, recently planted trees are most susceptible as are trees that are stressed due to drought or other plant stresses. Pest monitoring Watch for water soaked areas, depressions in the bark or cracks through which frass may be seen. Birds peck the larvae from under the bark. Some wasp parasites attack the borer. Carpenter ants eat both larvae and pupae from the wood but may in turn construct galleries for their nest. As the borer is attracted to weakened trees, the best control is to keep trees healthy. Larvae cannot thrive in trees that are vigorous and full of sap. Avoid wounding plants, and follow good pruning, watering, and fertilization practices. To prevent sunburn, paint the trunk with white latex paint. Keep weeds, grass, and trash from the base of the trees to make it easier to detect and remove borers.